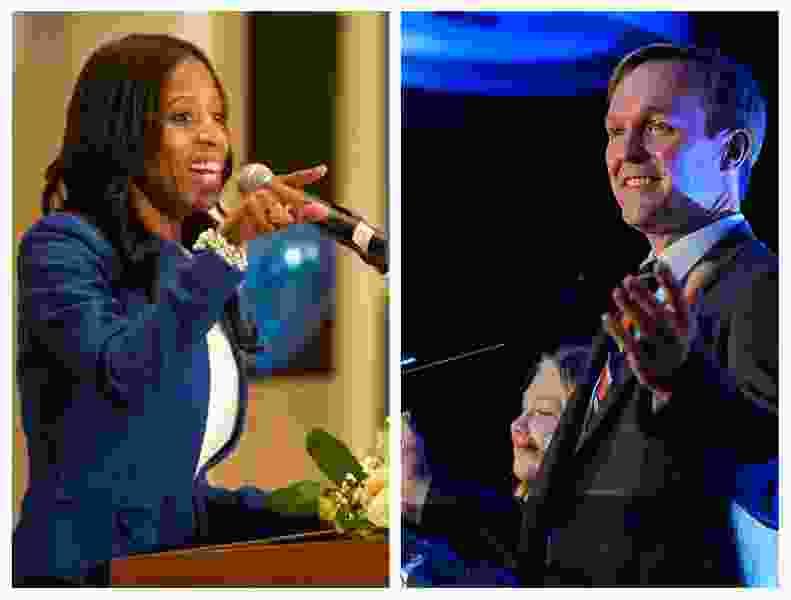 (Tribune File Photos) Salt Lake County Mayor Ben McAdams, right, trails U.S. Rep. Mia Love by 6 points in latest poll. In arm-wrestling terms, a new poll shows that GOP Rep. Mia Love and Democratic Salt Lake County Mayor Ben McAdams are grunting and pulling with all their might — but remain in a so-far-unmovable deadlock that tilts slightly in Love’s favor. Similar to margins in many surveys over the past eight months, the pair is still 6 percentage points apart in a new Salt Lake Tribune-Hinckley Institute of Politics poll — which has a margin of error of 5 points, plus or minus. It is essentially a statistical tie. 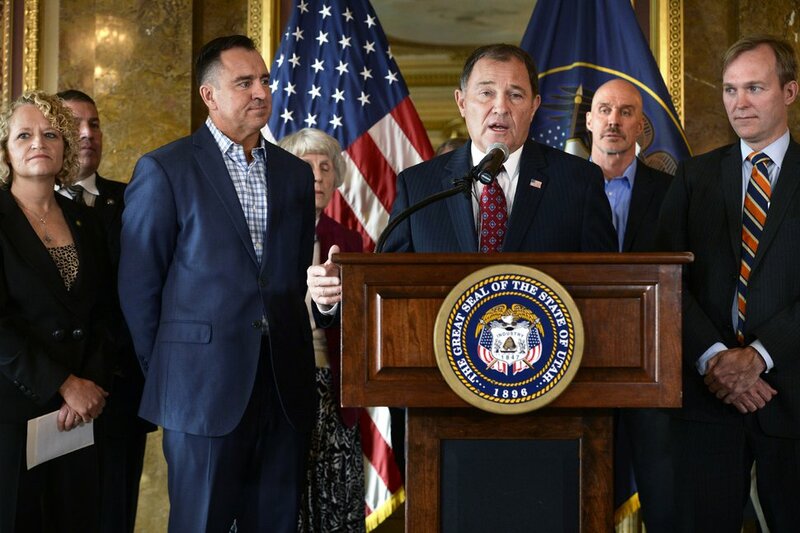 “Of the major races in the state, this continues to be the one that is the closest,” said Jason Perry, director of the Hinckley Institute of Politics at the University of Utah. And it is not moving in either direction yet. In such a close race and poll, both sides see reasons to take heart. McAdams’ campaign cheers that he has a 2-1 margin of support among unaffiliated voters, a key group for him to win. Love’s camp enjoys her lead and says late-deciding voters in the district lean Republican, and she has a history of winning them. The new poll shows Love leads McAdams 45 percent to 39, with 8 percent favoring others (even though no one else is on the ballot) and 8 percent undecided. Data show that both candidates are holding their base well. McAdams is favored by 91 percent of Democrats, and Love is favored by 75 percent of Republicans. “The effort right now is to win over independent voters because so many people in the Republican and Democratic parties have already made their decision,” Perry said. And 38 percent of all Utah voters are unaffiliated. McAdams is doing better with that group — which actually outnumbers Democrats. He is winning unaffiliated voters by a 53-27 percent margin. “The mayor has done a really good job of reaching across party lines to get things done. That resonates well with unaffiliated voters, and that’s why he leads by a 2-1 margin with that group,” said Andrew Roberts, campaign manager for McAdams. “The mayor has rolled up his sleeves and worked with the Republican speaker of the House as well as the Republican lieutenant governor to address our homelessness and opioid crises. And he has worked with the Republican County Council to do just about everything,” perhaps helping with GOP voters, too. For example, she lost to former Rep. Jim Matheson by 768 votes in 2012. She beat Doug Owens in 2014 by 5 points, and the margin grew to 12 points when she beat Owens again in 2016. The new poll also included a separate question asking voters if they approve or disapprove of Love’s performance in office. It showed a plurality of voters approved by a 48 percent to 40 percent margin, with 11 percent undecided. Among unaffiliated voters, a plurality disapproved by a 49-35 margin. Democrats also disapproved by an 83-11 margin. But Republicans approved 72-19. “Fewer than half the voters in the 4th District approve of the job she’s doing. That’s a big problem for her,” Roberts said. This year’s midterm elections are when the party of the incumbent president usually loses seats in Congress — and President Donald Trump has only mediocre approval in Utah and worse ratings in the 4th District, where 53 percent disapprove. His policies on immigration have been the target of much criticism by Utahns. Riding says Love is positioned well to handle that, including recently speaking out against separating families of illegal immigrants at the border and supporting “Dreamers” brought as children by undocumented immigrant parents. She is a daughter of Haitian immigrants. 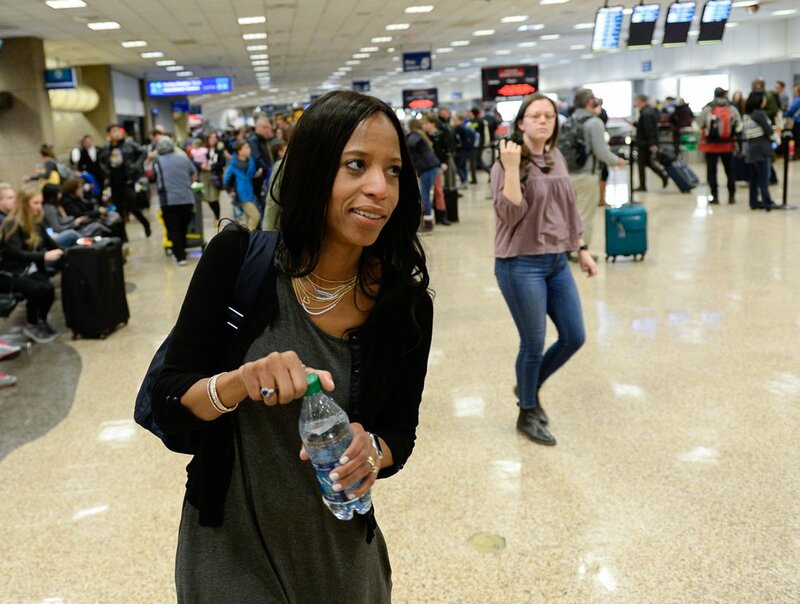 (Francisco Kjolseth | The Salt Lake Tribune) Rep. Mia Love arrives at Salt Lake International airport on Thursday, Jan. 11, 2018. Love, a Utah Republican and the only Haitian-American in Congress, called on President Donald Trump to apologize after reports said he questioned why the United States was allowing immigrants from “s---hole countries” like Haiti, El Salvador and African nations. The poll surveyed 379 registered voters in the 4th District from June 11-18.